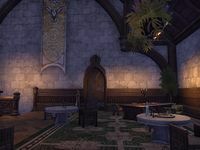 It's only a single room, but the advantage of this inn apartment is its unrivaled location, just steps from the gates of Alinor. That, and the rare prestige of an Alinor address! Golden Gryphon Garret is a player room in Alinor. It is located on the third floor of the The Golden Gryphon inn. The room can be obtained for free by completing Room to Spare. Note that you must start this quest in Alinor. If you start the quest in your Alliance's zone or Vivec City, you will earn the inn room there instead (even if you already have it from another character). It can also be purchased outright for a nominal fee of 000030003,000  . Unlike the three Alliance inn rooms, this room will not earn you the Permanent Tenant achievement. However, since all homes are shared across your account, you can always either pay the 000030003,000  or acquire these rooms with another character and enter one of them to get the achievement.